FREEPORT, Grand Bahama – Prime Minister The Rt. Hon. Perry Gladstone Christie was in Grand Bahama Thursday morning, March 31, participating in ground breaking ceremonies for Pharmachem Technologies G.B. Limited Manufacturing Plant 3. Situated at Pharmachem’s current site on West Sunrise Highway, the new facility will cost in excess of $120 million. The Prime Minister projected construction of the new Pharmachem plant will have a long-term positive effect on the Bahamian economy, generating employment for highly-skilled technical jobs and semi-skilled jobs for the next 20 years. The new plant will be a combined effort of Pharmachem and Gilead Sciences. Gilead is a biopharmaceutical company headquartered in Foster City, California, which discovers, develops and commercializes innovative therapeutics in areas of unmet medical need. The company’s mission is to advance the care of patients suffering from life-threatening diseases worldwide. This new facility is dedicated to the exclusive production of Gilead medicines. The company’s relationship with Pharmachem, together with the Grand Bahama Port Authority dates back to more than a decade. Since Pharmachem’s establishment and configuration in 2004, the facility, formerly known as Syntex has become one of the key suppliers of active pharmaceutical ingredients (APLs) and registered intermediates for Gilead’s antiretroviral therapies used to help people with HIV/AIDS. According to a spokesman for Gilead, one HIV medicine that is currently produced in Grand Bahama, Tenofovir Disoproxil Fumarate or TDF, is the backbone of HIV treatment around the world, reaching 160 countries. Last year, Pharmachem was one of Gilead’s largest suppliers of TDF, manufacturing a quantity to treat 950,000 people, a company spokesman pointed out. 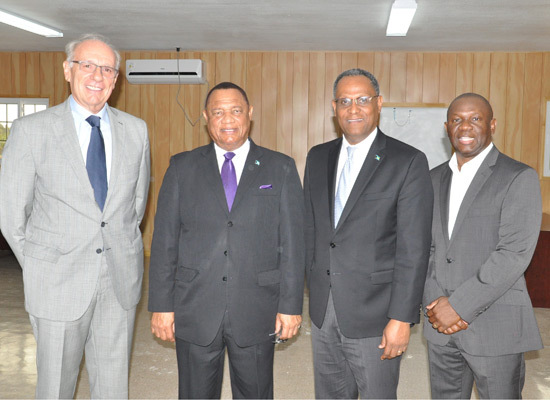 Prime Minister Christie was thankful to Pharmachem’s principals for their strong manifestation of confidence in the Government and the economy of The Bahamas. Mr. Christie told the audience which included a large number of business persons that it is his fervent hope that for decades to come, international and innovative companies such as Pharmachem, which are domiciled in Grand Bahama would continue to choose the island for the reason that they would be operating within a business and regulatory environment that has met all known international standards and best practices. He said that his administration’s heightened focused is on turning Grand Bahama into a mecca for international business as well as an unrivalled touristic and residential haven. The Prime Minister also touched on Grand Bahama’s safe business environment and the island’s modern infrastructure. According to the nation’s leader all it would take for Grand Bahama to surpass all others in the region as a best in class environment for business growth is the alignment of corporate and political will around transparency, trust and a real commitment to the further planning, development and promotion of the island along with commitment to employee training. He said the construction of the new Pharmachem plant will have a beneficial and positive effect for The Bahamas and the Bahamian economy as longer-term employment is guaranteed over the next decade. Further, Mr. Christie said that it is estimated that the new commercial facility could continue to generate employment in The Bahamas for highly-skilled, technical jobs as well as semi-skilled jobs for the next 20 years. As such Pharmachem will be a standard bearer, embodying the spirit of the new public/private partnership regime between the Government, the Grand Bahama Port Authority, and major stakeholders, which they wish to roll-out within the coming months. Also bringing remarks and the ground breaking was Mr. Pietro Stefanutti, President of Pharmachem Technologies; and Dr. Regan Shae, Senior Vice President, Chemical & Biologics Operation, Gilead Sciences Inc. According to Dr. Shae “we are hopeful the addition of the new facility will significantly increase Pharmachem’s contribution to The Bahamas’ growing life sciences industry and local economy through increased job creation and research and development into new areas of unmet medical needs.